Aron Ralston couldn’t be contained and he wasn’t going to let anyone hold him back from exploring deep canyons or scaling perilous cliffs. That rush of adrenalin as he tackled the impossible was everything, and like most addicts, he damaged a lot of relationships for the sake of his rush. Director Danny Boyle (28 Days Later, Slumdog Millionaire) takes Aron’s story of survival and will and transforms it into something transcendent that becomes incredibly philosophic. The film succeeds based on two factors; the acting of James Franco and what is essentially a masterclass in film editing as storytelling. The film begins with Aron ignoring a phone call from his sister on the day before her wedding, as he heads for Blue John Canyon in his home of Utah. Once there he sets off on his hike, having not told a soul where he planned on going. Eventually, Aron runs into a pair of young women not quite as well versed on the inns and outs of this location so he shows them some of the off the beaten path highlights. He continues on his own journey and decides to descend into the canyon through a trickier path. The result is a boulder shifts loose under his grip and his right arm becomes pinned beneath. The panic doesn’t set in immediately, and being the quick thinking outdoorsman he is, Aron goes through all the right steps: He assesses all the supplies he has, how much water is left, and even tries to chip away at the canyon wall on the other side of his arm with his pocket knife. It becomes apparent there won’t be help coming to this spot so far away from civilization and, after two days, the hallucinations begin. 127 Hours is a wonderfully uplifting humanist film. The sheer power of Aron’s will is staggering. It’s no secret how Aron finally freed himself from the boulder by amputating his own arm. And it wasn’t a dead arm, blood flow completely stopped by the pressure of the boulder. No, Aron had to slice through his own nerves, a scene which is composed perfectly. Boyle is able to convey the complete sensory hell that it would have been to do this by causing the sound and images to shudder, distort, and blow out. The entire film is cut in a fascinating way, typically diving the screen into thirds and either showing a scene from three angles simultaneously, or weaving hallucination and reality together. As Aron is pinned he begins to reflect back on his foolishness, especially with his family and friends. He has constantly bucked dependency on others in favor of charging forward on his own. He even has a moment where he sees his life as being a single path towards this moment, his independence inevitably leading him to be alone and unable to reach out when he finally needs it. There are also what can only be described as premonitions, Aron seeing a young boy who he believes is his future son, a motivating factor for the decision he finally makes. I was surprised by how much I liked this film. Not being a big fan of director Boyle’s, I anticipated it would be okay. Instead, its my favorite film I have seen in 2011 so far. It is a feel good movie in a very honest way, unlike most Hollywood crowd pleasers that get to their ends by deceitful storytelling. 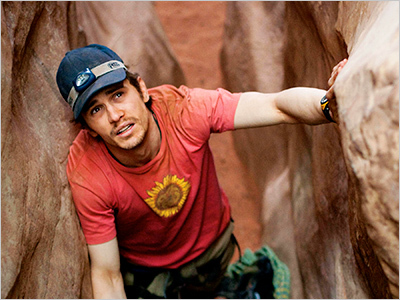 127 Hours is a beautiful film about the human spirit, in particular about how we need each other. In one of the final scenes, as the now single armed Aron is stumbling through the wilderness he spies a family hiking. He tries to yell out but his voice has gone hoarse from dehydration, when he finally lets out that bellow of “I need help” it is impossible not to weep. His character has fully evolved, he has learned that he must balance his independence with dependence on his fellow man.